Me and Rishi, an ex-TAAQ roadie, were with Bruce in his hotel room, catching up, talking songs, gear and biting his ears with questions while he was ‘leesurely’ penning down the set list. “Wonder how it’s gonna be… we haven’t played Hyderabad for a long time and are playing our new material mostly,” Bruce expressed with a tiny whim of uncertainty. 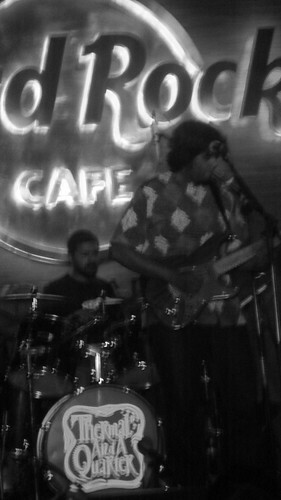 Moments later, Rajeev and Rzhude walked in, looked at the set list, nodded… that’s all. 1. Pockets of musicians in the front row counting odd time signatures. 2. Guitar players gleefully fretting… ‘How-does-he-do-that-man’ over every blue note. 5. A cute girl from Dilli Oye singing almost all the songs. 9. “Chanineese Items”…”Without Wings”…”Jupiter Café”…”Motorbyckle”… all old songs denied! As men, we feel very flattered when a woman says nice things about us. So when the young and eloquent Ramya Sriram gushed about our gig at Hard Rock Cafe, Hyderabad, where we played last Thursday, we blushed. And then, without a thought, plagiarised this bit from her blog and cut-paste-posted it here. The show was brilliant. They started off with one of my favourites, Look at Me, and by the end of the song I was already filled with that feeling only Bruce’s tu ta paraburapurooo can express. The new song, Where the State has No Name is a bluesy, catchy number and has one of those choruses that comfortably settle down in your head. A total singalong song. I really liked that they wrote this one. I’ve always believed that TAAQ is an intelligent band; from their lyrics to the structure of their songs, there’s a characteristic subtle wit that underlies. They’re classic, they’re contemporary. They reach out to the audience with songs like this one, and previously, with Keep the Promise, One Small Love and Shut up and Vote. 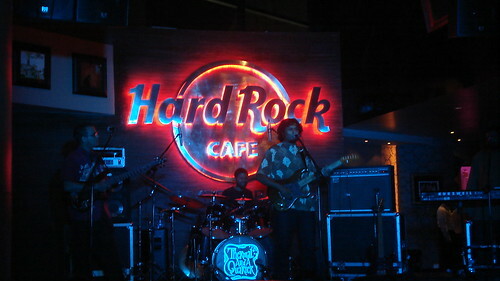 It was the first time I heard them play their signature cover, with its long intro (oh what tones on the guitar!) delightfully breaking out into Roxanne. At this point I glanced at the bouncer, contemplating my fate if I did get hysterical. De-arranged was anything but. I love how all the parts come together in their songs. I grinned throughout the show, and everytime Bruce went hic! during Drunk I grinned a little more. We’ll post some pics once our missing-in-action roadie with the throaty heavy-metal caller tune resurfaces with them. Meanwhile, if any of you have taken photos on Thursday, be kind enough to share them so that we can see what we looked like that night. And here’s to all of you in Hyderabad: You made it a very memorable gig for us, no matter what you name your state. You have spirit, and you have guts for braving the bundh to watch us. Thank you! As for ‘where the state has no name’, we’re not done making a noise about that yet! There is only one correct answer: Deep Purple, April 2001. We were surprised to receive a number of incorrect answers that said Jethro Tull, which was our second support act in 2006. We also supported Megadeth and Machine Head in 2008. Our winners: Jayanth S, Bharath R, Bhargava Venkatesh, Anil V Anand, Arul Baliah, Ananth R and Aseem Mudbidri. Congratulations, folks! Take a bow-wow! Samson Madella from Hyderabad asks this month’s question. Special affection awaits the winner who also identifies the song and the album. Bung in those answers. If you missed the recent issue of ThermalAndAQuarterly, our newsletter for the loyal TAAQ fan, eyeball your copy here. Better still, sign up. We have a special fondness for Hyderabad because our third record Plan B was put together there at Ramoji Film City in 2004. Now, it saddens us to hear that this erstwhile princely state that has its own cricket team is turning into Jekyllabad (if you will excuse the atrocious pun), torn asunder as it is by contending claims for statehood. War-cries for new states are ringing across the country. And in nearby Puduchery (Pondicherry as we still love to call it), a new fight has erupted against statehood. Drawing and re-drawing borders within borders… what a state for a nation to be in, we thought. Didn’t you too? While we have time left, we shall give our fans in undivided Andhra Pradesh something to sing about. Here’s the chorus of a new bluesy number we composed just for the occasion. We’ll perform this number at our concert in Hyderabad on January 21. Be there and don’t forget to sing along. Congratulations, dear winner! Whenever you have the time, do drop in at our pad to claim your complimentary pot of Paper Pulissery (which, for the uninitiated, is a buttermilk-based curried dish that goes excellently with Mallu-style fried fish). And as part of the festivities, we shall offer a series of Java Jazz videos for your viewing pleasure (none of them, regrettably, featuring Jeff Peters on bass!). Jeff – Hope you’re enjoying a good chuckle! Thank you for voting, ladies and gentlemen. Here’s to the 2010 awards, as there shall doubtless be plenty of contenders! Nearly a whole year late, a whole lotta videos from the Java Jazz Festival 09 at Jakarta, where we performed last year. This set includes a video of Vinny Valentino guesting on TAAQ material.